A baseball prodigy should be the favorite, but instead, he's the underdog. Think this is the Bad News Bears? Then think again! It's Major. Goro has hopes and dreams, just as we all had when we were kids. Some children wanted to be doctors or lawyers. Most boys always dreamed of being a pro athlete, just like their sports heroes. Goro's hero happens to be his father, who is a professional baseball player. Goro and his mother used to watch as his father dominated the game, but things have changed now. 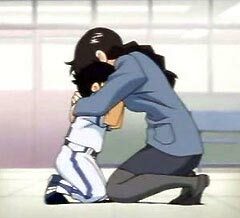 Goro lost his mother to an unknown illness, baseball isn't as popular as it used to be, and his father isn't the best pitcher on the team anymore. Goro's father used to be the ace pitcher for his team, but after having a hernia and a serious elbow injury, his game hasn't been the same. Since the injuries, the team has sent him down to the minors, and his career is going downhill. The club, not taking any chances, tells Shigeharu that they cannot wait for his injury to heal, and that they will be looking at younger, healthier players over him. They ask him to retire, and in the process of retirement, they offer him a position as a scout. Frustrated and lost, Shigeharu accepts their decision. While coming home, he bumps into his best friend Shigeno, who happens to be the star ace of the team now. Shigeno, who has known Shigeharu since they were in high school, is upset at Shigeharu’s decision to retire, and he suggests for him to try to become a hitter. After thinking it over, he returns to the office and asks to be given a chance as a hitter, but the office denies his request. Shigeharu makes a final request: to let him hit against one of the team’s pitchers. If he fails, he will officially retire. The batting test allows Shigeharu three outs. If he hits, he's on the team; if not, he must retire. Shigeno, hearing of the bet, decides that he wants to pitch to him. The two friends battle it out. First at bat is a strike out, the second is a pop out, and finally, he realizes how much fun he had in the past as a batter. Shigeharu goes all-out in his final bat, and he hacks away. Foul after foul ball, he keeps on missing, until finally he gets the perfect pitch, and he nails it over the center field. Things are beginning to look better for the Honda family, as Goro makes a new friend, Toshi. Toshi is a sheltered boy whose parents force education over entertainment. Goro sees Toshi, and he gets him to come out and play catch. The two become instant friends. One day, both Goro and Toshi see a Little League team practicing. Goro, wanting to play, gets laughed at and kicked off the field. Goro is determined not to give up, so he shows the team his skills. Goro is a baseball prodigy, as some would say. At the age of five, he throws fastballs better than kids twice as old as him. The manager of the team notices Goro’s talent, and he shows him a few pitches, such as a curve ball. Goro, being the prodigy that he is, picks up the pitch with ease. Goro tells his father that he has been accepted on the Little League team, to his father's disapproval. His father, understanding his own life and injuries, refuses to let his son at the tender age of five to throw a real baseball, and he confronts the manager to let him know that he won’t allow his son to be on the team. The manager sees Goro’s innate talent, but he agrees to wait until Goro is nine years old to accept him on the team. Goro, upset and sad, believing his father does not love him anymore, talks to Momoko, his teacher. Upon returning home, Shigeharu is shocked to see Momoko cleaning up the bathroom. Shigeharu tells Momoko that he has been brought up to the majors, and he gives her tickets to take Goro to the game. At the game, Goro learns that his father is not a pitcher anymore, but a batter. 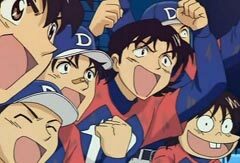 Shocked that his father didn't tell him, he rushes down to support his father, and Shigeharu hits a home run to win the game. Shigeharu is now a full-time batter, and he is doing great. Momoko continues to help out with Goro, and Shigeharu sees something that he hasn't thought of in years: a resemblance to his late wife, Chaki. From that moment, Shigeharu and Momoko become closer, but Shigeharu is hesitant, because he is afraid of what Goro might think of her becoming his new mother. Goro, however, is very fond of the idea, and things can't be any better. The season is over, Shigeharu is a star once again, and in the upcoming season, he looks to continue where he left off. Say hello to Joe Gibson, an American ace who came over to Japan for the money. Tall, blonde and very arrogant, his only intent is to dominate the Japanese league. He has no care for the team that he plays for or those that he plays against. He backs up his arrogance with high 98 to 100 mph fastballs. He throws nothing but fastballs, showing no respect to the Japanese players. Shigeharu, not believing in all of the hype, battles and eventually slays the American monster as he hits a home run off of him. Gibson is shocked and shaken, as he never thought that any Japanese player could hit his fastball, especially not a home run. The manager, seeing Gibson's game changing, decides to play small ball with bunting, stealing and sacrifices, but no home runs. Gibson’s ego gets the best of him, as he believes that this isn't how baseball is supposed to be played. When Shigeharu is up to bat again, he lets loose a ball that hits Shigeharu in the head. Feeling no effects from the pitch, Shigeharu gets up and takes his base. After the game, Momoko and Shigeharu are alone while Goro is asleep, and Shigeharu asks Momoko if she would like to meet his family. Later that night, Shigeharu gets up to get some water. All the sudden, it hits him. 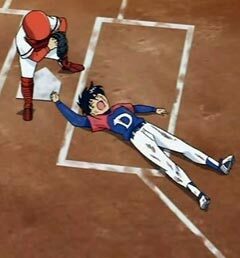 The hit from the ball didn't bother him during the game, but now the damage is taking its effect, as Shigeharu collapses. Goro awakes, and he thinks that his dad is asleep. He gets a phone call from his dad's friend, Shigeno. Shigeno tells Goro to go and wake up his dad. After some unsuccessful attempts to wake his father, Goro looks in horror and touches his hand... Shigeharu, Goro's father is dead. 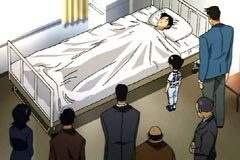 The tragic news spreads throughout the community as Shigeharu’s death is announced. Joe Gibson, still upset at how the Japanese play baseball, tells his translator that he is going to leave and go back to the US. While his rant continue, his translator gets the shocking news, and he informs Joe, who falls into total shock. The worst is Momoko, who just told her parents about a man that she wants them to meet. Her roommate is happy for her, and while watching TV, the news of Shigeharu’s death strikes Momoko like a dagger through the heart. Three years has passed. Goro is now nine years old, living with Momoko, and he looks forward to finally playing in the Little League. Baseball isn't as popular as it used to be, and the local little league team is fighting with the youth soccer team for field space. Goro, now old enough to play, wants to join the Mifune Dolphins, the same team that tried to get him to join when he was five years old. The only problem is they are short three players to field a team, or else the team loses the field to the soccer team. Goro, confident baseball genius that he is, believes that it will be easy to get anyone to play baseball with him. However, no one wants to join, and Goro is almost out of options. Class president Shimizu lashes out at Goro about how baseball is a lame sport. Goro, who loves the game with a passion, takes offense and explains how passionate he is for the game. Shimizu apologizes and offers to join Goro and play baseball. Shimizu tries, having never played baseball before, but Goro has no patience with her. Goro has been playing by himself for most of his life, never with a team, so he lacks teamwork skills. This is shown throughout the series, as Goro slowly learns how valuable teammates can be. 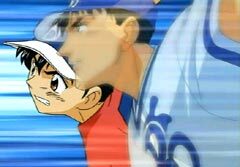 Luck brings Komori to Goro, and he learns that Komori can actually play baseball and catch his fastball. The final piece lies in the bully Sawamura, who happens to play soccer. Sawamura is shown as the typical bully who used to bully Komori until Goro stepped in. The team eventually wins their field, and Goro is on a Little League team at last. Unfortunately, Goro, not adapting to other teammates and their abilities, expects each player to be up to his skill level. With some encouragement and pride swallowing, Goro learns to understand his teammates, and he works hard with them to become a better team. His energy brings out the best in his teammates, and even Shimizu becomes a better player. The Mifune Dolphins are finally ready for some action. They all go to a summer camp, where Goro learns of a mental block that he has. Because of the loss of his father, he is afraid to throw inside on a batter. Determined not to give up, he eventually meets the Little League team that his father used to play for. While scouting, he notices someone who looks familiar catching the ball; it's Toshi! Toshi has grown up, and he is now playing for the Yokohama Little League team, the best in Japan and one which has produced many stars, including Goro's father. To help Goro with his current dilemma, the Yokohama coach tells Goro a story about himself and his father, and that his pitches can’t do much damage even without a helmet. Goro understands, and finally, he can throw inside again. However, when the game ends, Goro is stubborn and he refuses to let the game end. Toshi is brought up to bat, and if he can get a hit off of Goro, Goro will stop his complaining. 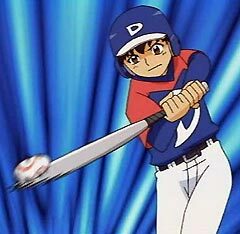 A valuable lesson is learned by Goro as he is hit by his old friend: he can't live off of fastballs forever. 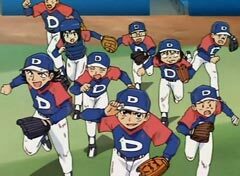 The Mifune Dolphins set off to become the best team, and they enter into the fall tournament where they will face many teams, all with different abilities and characters. There is one team who has triplets that form a powerful defensive triangle called the Honmoku's Black Triangle, and you have a pitcher who can throw forkballs. 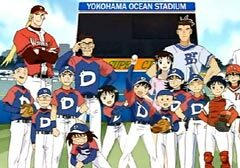 Let's not forget about the Yokohama Little League team either. 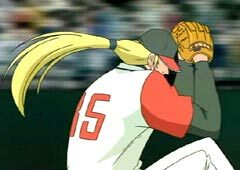 Major is a great anime that isn't just about baseball. The show brings out many characters and their emotional attachment to the game. We all know that Goro is a baseball prodigy, but he is the underdog compared to the suffering that he has experienced in his past. 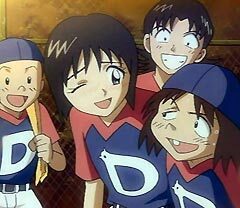 Shimizu, a girl who has never heard of baseball, gives it a try, and she falls in love with the game and its atmosphere. There is so much more, and every character is introduced and developed properly. Life is more than just sports, but sports can create better opportunities in life and teach you things that a normal classroom cannot. This is one of the many themes that Major presents. Major is currently a long-running manga by Takuya Mitsuda, with the animated show adapted from the manga. Currently, there is a second season in the works. The casual or anime fan who does not like sport anime will watch this show for the great character development, the themes and overall sense that with teamwork and support, you can achieve anything if you really want it.